It’s finally here. At least it feels like finally to me. Help My Unbelief: Why Doubt is Not the Enemy of Faith releases today! A book release feels like a big freaking deal to an author because of the work that went into it, the support we receive from many, the message we hop connects with readers, and the relief (and/or terror) of putting our written words in other people’s hands finally. I am so thankful to all who have encouraged and assisted in this launch. I particularly want to thank those who contributed to the “Help My Unbelief” blog series for their time, honesty, insights, and encouragement to me and readers. Here are some kind endorsements people wrote. Some Christians have a simple faith unencumbered by doubt. For the rest of us, things aren’t so easy. We question. We second-guess. We always want to know why. Help My Unbelief is the perfect book for us. With accessible prose and unflinching honesty Barnabas explores belief that encompasses, is even strengthened by, doubt. Anyone navigating a faith filled with doubts will find Barnabas a sympathetic and reliable guide. Sometimes believers can give the impression that the Christian life is always one of triumph and confidence. This book by Barnabas Piper counsels us on how to trust God when our faith is weak and wavering. It calls us away from a demon-like faith, that simply knows the data about God, to a childlike faith that cries out “I believe; help my unbelief.” If you find yourself doubting, or if you love someone who does, this book will refresh and encourage. Help My Unbelief gives the church permission to exhale. It’s a book which pulls up a chair and looks in the eyes of the doubter and says, “You’re not alone, friend.” Doubt, says Barnabas Piper, is not the antithesis of Faith. Rather, it’s a gateway. The key is to ask the right questions, and to be open to God’s answers. For this particular disillusioned pastor’s daughter, Piper’s words are a lifeline—and the key to drawing today’s youth back into Christendom. Too often our struggles with doubt are hidden, pushed into the back of the cupboard like a corrosive agent that is too dangerous to touch. With clarity, warmth and candour, Barnabas Piper shows us that doubt does not have to be something which corrodes, but rather in its right place can be something that strengthens faith. – Mark Sayers: Pastor of Red Church, Melbourne, and author of Facing Leviathan and The Road Trip That Changed the World. Barnabas Piper’s Help my Unbelief is an honest, self-revealing and engaging treatment of an important subject. This winsome and well-reasoned book avoids clichés and easy, superficial answers. It will benefit many—including those who doubt, those who “sort of” believe, and those who believe, yet long to do so more completely. 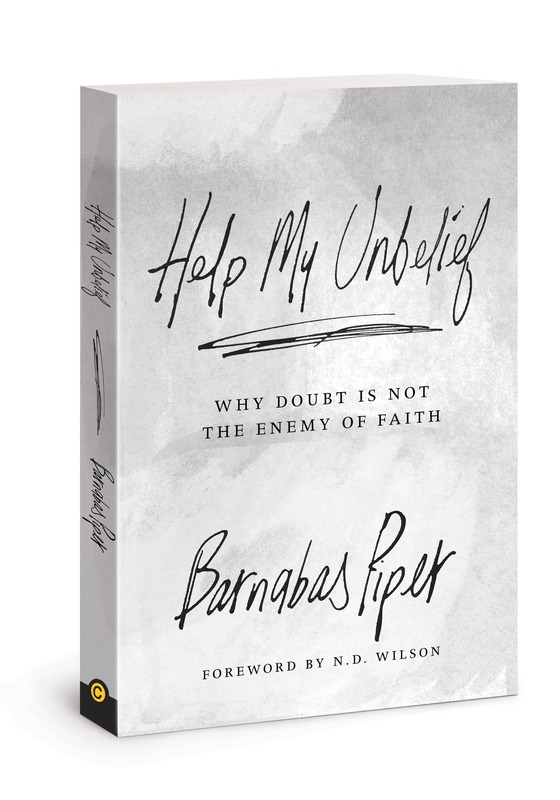 I’m really excited for you to read Barnabas’ new book, Help My Unbelief: Why Doubt is Not The Enemy of Faith. Barnabas writes in a ruthlessly honest and raw way. This book is going to help an entire generation grow and blossom in their faith in midst of wrestling with doubt. – Derwin L. Gray, Lead Pastor Transformation Church, Author of Limitless Life: You Are More Than Your Past When God Holds Your Future. Barnabas Piper in Help My Unbelief makes a clear and compelling case for faith amidst the sea of doubts many experience in Christianity. It’s a necessary book for our generation. Barnabas Piper’s Help My Unbelief is an encouraging, honest look at an essential but under-discussed aspect of faith: the tension between belief and unbelief. It’s a tension that need not be feared. Piper shows us, rather, how the tension can be healthy and ultimately leave us stronger in our faith. For any believer who has felt alone in their wrestle with unbelief, or who was mistakenly taught that true belief is always ironclad, this valuable and timely book is for you.